The most complete, comprehensive creatine foundational supplement. You get a full daily dose of the most cutting-edge creatines, plus a ton of other actives including NO boosters, cell volumizers, energy complex, antioxidants–all in one convenient "pack. "* This baby's got it all. "This stuff's great! Works within half an hour, not like your typical creatine supplement. Gives you a pump throughout your workout from beginning to end. * Highly recommended for anyone who is serious about getting big and strong." - Jimmy V.
Even if you are strong and pumped, how can you possibly tear the gym apart if you're energy deprived and lacking mental concentration? Daily life is filled with constant roadblocks that try to throw you off in the iron game. So when it comes to energy, Animal Pump has got your back. Animal Pump's Energy Rush Complex combines powerful methylxanthines along with evodiamine and vinpocentine to give you that energy boost that gets you fired up for training and the focus and mental acuity so vital to establishing the mind-muscle connection. * These powerful substances reach deep into the muscle cell to provide long-lasting energy and power, thus delaying the onset of muscle fatigue. * That performance and focus edge can be the difference between the physique of a weekend warrior and a top competitor. Last but certainly not least, a supreme nutrient transport complex, a blend of insulin boosters and absorption enhancers, ties the Animal Pump formula together. * This complex efficiently and quickly draws all of these critical nutrients to your muscles. * Insulin is especially important for channeling this powerful cutting edge blend into your muscle cells. Sugar-laden formulas of the past helped boost insulin levels, however they also added unnecessary carbohydrates. Those who hate the creatine "bloat"
To optimize the "pump" use one pack 30 minutes before your workout. * Do not consume any whole foods or protein shakes between your daily dose of Animal Pump and your training session. In order to maximize results, be sure to stay hydrated and prioritize the uptake of fluids before and during training. Animal Pump can be taken year round, without cycling off. 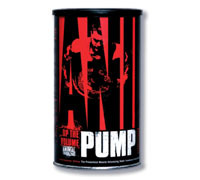 Like Animal Pak, Animal Flex and Animal Nitro/G, Pump is designed as a core or "foundational supplement". For bigger gains, consider stacking Pump with Stak. Directions: As a "core" or foundational preworkout supplement, take a single pack 30 - 45 minutes before you lift, preferably on an empty stomach. As each pack also contains your full, daily dose of creatine, take Pump every day for optimal results. On non-training days, you can take the pack around the same time as you would if you were training. You can remove the red capsule (stims) on off days, or if you train at night.